Tom Shingler visits Nuno Mendes' Taberna do Mercado in London to see how much work goes into creating a Portuguese suckling pig banquet. Warning: some of the pig preparation images are quite graphic! 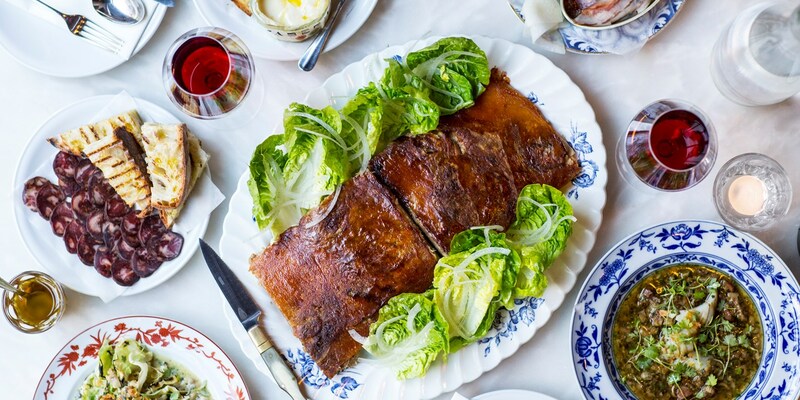 From now until Christmas, groups of foodies after something special can book themselves a table at Nuno Mendes’ laidback Portuguese restaurant Taberna do Mercado and tuck into leitão assado – Portuguese-style suckling pig – and a whole host of side dishes inspired by the country. Deboned, pressed and cooked until the skin turns so crisp it’s like a shard of glass, the entire pig is presented as one perfectly cooked block, ready for everyone to dig into, with the legs cooked separately on the side. The task of cooking these pigs falls on the shoulders of head chef Antonio Galapito, who has been working on and off with Nuno for the past seven years. It’s no mean feat; the whole process takes three days from start to finish, but the results are stunning. It’s no wonder the dish is the centrepiece to many Portuguese Christmas feasts. While Christmas doesn’t mean suckling pig for everyone in Portugal – bacalhau is the preferred dish in some regions and for many it’s the desserts that steal the show – for Antonio and Nuno it’s entwined with festive feasting. ‘There are two regions of Portugal that are famous for producing suckling pig,’ explains Antonio. ‘I come from near Sintra, in the centre of the country, which is where the pigs we work with come from. The other place is called Mealhada, Bairrada in the northwest, which is very famous for this dish. In Sintra the pig tends to be cooked with lots of paprika and white wine, with the pig split open and cooked over a wood fire, whereas in Mealhada it is flavoured with bay leaf and garlic, but roasted whole so the meat is crisp on the outside and steamed within. While it’s certainly fun for the diners, it takes Antonio days of prep to get the pork to taste just how he wants it. And it’s certainly not for the squeamish – the whole pig is split open, steamed, then picked clean (head and all) before it’s ready for pressing. However, here at Great British Chefs we fully believe that if you’re happy to eat one of the tastiest pork dishes on the planet, you should have no qualms seeing an image or two of how it’s made. Scroll down to see Antonio at work, as well as a few of the delicious side dishes he serves with his festive Portuguese feast. When it comes to side dishes, the suckling pig is usually left well alone – after all, with such an intensely porky and deliciously rich plate of food, you don't want to detract from the flavour. But at Taberna do Mercado, Antonio serves plenty of his other beloved small plates alongside, so diners get plenty to choose from, along with Portuguese charcuterie and cheeses with plenty of chewy grilled bread to ensure no one is left hungry. So there you have it – while the sheet of suckling pig is incredibly easy to eat (no bones mean you can simply stick your fork in, twist, and be rewarded with a mouthful of tender, flavourful meat), it takes three days and many different processes to get it to the final stage. Portuguese food might not be as well-known as French, Spanish or Italian, but with dishes like this on the menu it can't be long before we start to appreciate this simple yet delicious cuisine. To find out more about Antonio’s feast and how to book, click here.